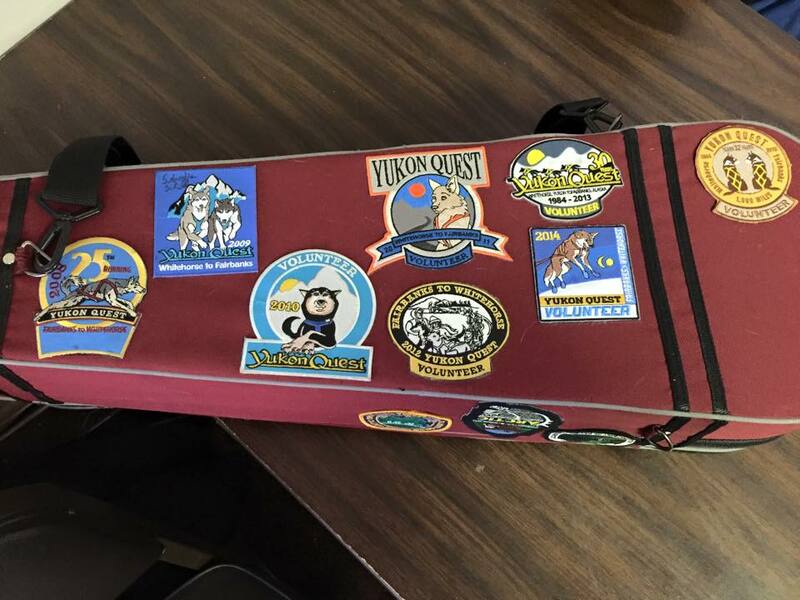 As some of you know I work for a remote checkpoint for the Yukon Quest 1000 Mile International Sled Dog Race. Well, this year I am the checkpoint manager, hence my low activity on the forum lately. It's a lot of work getting ready to open the checkpoint. The checkpoint is a few old cabins that are used by the owner in the summer for his gold mining operation. Yes, that still goes on up here in Alaska. Anyways, if you want to follow the race you can do so with trackers now at http://www.yukonquest.com. Or if you want to learn more about what happens at checkpoints, here is our new group. https://www.facebook.com/groups/mile101/ We have a lot of fun there and normally have a terrific group of people. Here are my volunteer patches on my fiddle case. Going to run out of room one of these days. Very cool. In 2000 I drove from Arizona to Anchorage through the Yukon. Beautiful place! Cool, followed your posts last year on the Iditarod - I apologise for my ignorance of the Alaskan country and the various routes - I assume the "Yukon Quest" is something "similar, but different" ? ... Bill goes to check it out... LOL ahhh.. right - got it - that IS cool - yeah !!! Sweet - I'll bet you get some great pictures to post/share - have a good time out there, nice ! ... as I say - could be this end... I'll check it tomorrow - and good luck on the YQ - it is a lot of effort - well done - and play fiddle when you can ! Me and the dog lot manager always stay an extra night after everyone has left to sit around the wood stove, bullsh*t, drink beer, and play the fiddle. Good times. 1stimestar Thanks for that link very cool. Stay safe and warm!! Awesome !!!! I shared your friend's recent post on FB, Georganne ! Lol thanks. Yes I got interviewed as the new Checkpoint Manager, it was in the paper. I was also interviewed by a Japanese film crew that was following along filming a Japanese musher. It was quite exciting, though it's getting harder and taking longer to recover from 36 hours of no sleep! I learned a lot though thankfully, none of the lessons were painful. Can't wait to do it again next year. This year the start was in Fairbanks so when they get to us they are still pretty bunched up, 36 hours solid then done. Next year they start in Whitehorse so by the time they get to us they are pretty spread out. Takes more time but we get more sleep. I lucked out with a super great crew, most of them new. We had all these young women who just kicked hiney. 3 of them are up here doing their masters for Archeology, one of them came up from Hawaii to do this. We also had 3 other guys and one other gal but they all left early before we had time for pictures.